Updated 25th January: ‘Star Wars’ legend Mark Hamill is providing the voice of ‘Kevin The Robot’. Mark Hamill is most famous for his roles on screen; in particular, playing the iconic role of Luke Skywalker in the ‘Star Wars’ film franchise. Mark is also renowned as one of the world’s leading voice actors and has voiced a number of character roles including ‘The Joker’ in ‘Batman: The Animated Series’, for which he won a BAFTA. Mark has also guest starred as a voice actor in the internationally acclaimed series, ‘Family Guy’ and ‘The Simpsons’. Mark said of his part in the production today, ‘I am thrilled to be the voice of a character in this new British Musical, and to be supporting Warwick in his new venture. ‘Kevin The Robot’ is a small but important cameo in this nostalgic show which is currently taking London by storm with a brilliant original soundtrack and story line’. 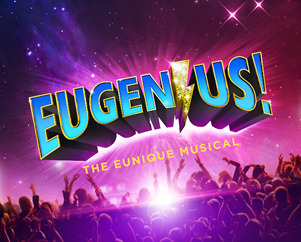 Warwick Davis and Kevin Wood have announced the full cast for the new musical “EUGENIUS!” which is coming to London for limited run at The Other Palace from 22nd January-3rd March 2018. Making his London theatre debut is American born Liam Forde who will play the lead role of ‘Eugene’. Liam has performed in many shows across America and is looking forward to making his debut across the pond. Joining Liam is Laura Baldwin who will play Eugene’s love interest- ‘Janey’. Laura’s previous credits include UK Tours of “Shrek” and “Betty Blue Eyes” and currently she can be seen in ‘Big Fish The Musical’ at The Other Palace. Joining them is Daniel Buckley (“Book Of Mormon”, “Loserville”) as Feris, Ian Hughes (“Guys and Dolls”, “The Lion King”) as Evil Lord Hector, Scott Paige (“The Addams Family”, “Chitty Chitty Bang Bang”) as Theo, Cameron Blakely (“Les Misérables”, “The Addams Family”) as Lex, Shaun Dalton (“Joseph and the Amazing Technicolor Dreamcoat”, “Beauty and The Beast” and “Les Misérables”) as Gerhard, Melissa James (“Bodyguard” UK Tour) as Carrie, Alexander Evans (UK Tour of “Sound of Music”, “Carousel”)as Eugene’s Dad and Alison Arnopp (“Dusty”, “The Tempest”) as Space Diva/Mrs T with Brian Gilligan, Jacob Fisher, Alex Tranter, Luke Dowling, Rosie Heath, Chloe Chambers and Frances Dee. Written by Ben Adams and Chris Wilkins, “EUGENIUS!” tells the story of Eugene, a teenage boy whose nightly dreams of a distant world of heroes and villains may just be the ticket to him creating his very own comic book movie in Hollywood. Joined by his best friends ‘Janey’ and ‘Feris’, our comic writing genius must discover the true meaning of growing up, finding the superhero within, saving the world from both earthbound villains and possibly those from distant galaxies, and along the way, falling in love. Ian Talbot will direct. He was previously the Artistic Director at the Regents Park Open Air Theatre for 20 years, for which he received an OBE. He has directed ‘Annie Get Your Gun’ and ‘Lend Me A Tenor’. The creative team is completed by Aaron Renfree who will choreograph, sound design by Gareth Owen, lighting by Andrew Ellis, musical supervision by Stuart Morley and musical direction by Darren Lord. Set and costume design will be by Hannah Wolfe and the show’s design features specially commissioned comic book artwork by Marvel artist, Simon Williams (Transformers, Spider Man, Marvel Heroes, The lncredible Hulk).